At the 36th annual Electrical Industry Exposition and Fiber Optics Expo, held in Washington, D.C., SpoolMaster received the coveted Contractor's Choice Award for product excellence. 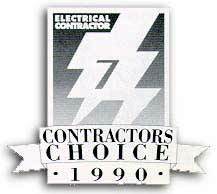 Chosen by a select panel of Electrical Industry professionals, the Contractor's Choice is an honor bestowed on manufacturers whose products offer the greatest advantage to the Electrical Construction Industry. Other Contractor's Choice Award winners were: 3M, Square D, Black and Decker, Greenlee Textron, and General Electric.